FOX and Friends talk show co-host Ainsley Earhart is on the news every morning as a result of her kind of job. But, in October 2012 she made news headlines for an entirely different reason, her marriage to former Clemson University quarterback Will Proctor. The union was her second one and it lasted exactly six years before news boards were again scrambling to report that her second husband had filed for divorce. Read on to find out more about the marriage and the drama surrounding divorce proceedings as well as other interesting facts about Proctor. Although he is more popularly known as Will Proctor, his name at birth was William Franklin Proctor II. His birth occurred on November 3, 1983, at Winter Park, Florida. As per his early education, he attended Trinity Preparatory School in Winter Park Florida. After high school, Proctor proceeded to Clemson University in South Carolina for his college education. 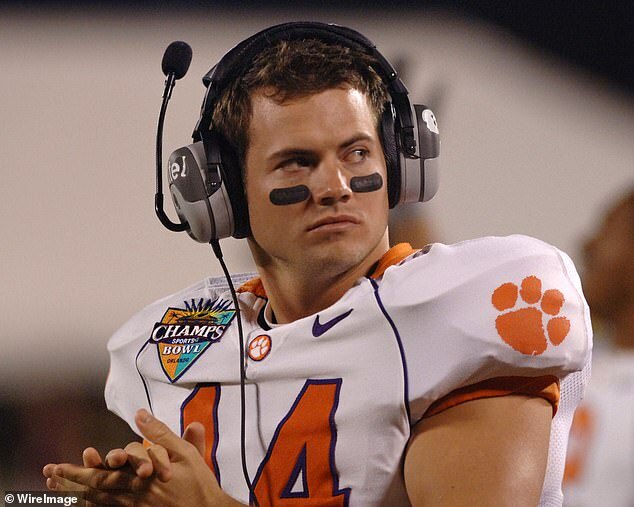 At Clemson, he was famous for being a part of his school’s football team, Clemson Tigers, where he first played as a wide receiver because he was a third-string QB before later becoming the team’s starting quarterback after playing backup for a while to future NFL player Charlie Whitehurst. Since leaving college, Will Proctor has played professional football in the Canada Football League (CFL). He played as a backup quarterback for Montreal Alouettes in the 2007 season before signing for the Calgary Stampeders in 2008. He won the 2008 Grey Cup with the Stampeders before going ahead to announce his retirement from professional football in July 2009. Until now, the reason Proctor had to retire after just a few years in the sport is not known, however, seeing that he was not playing at the highest level, ie the NFL, he probably aimed to do something else. In 2018, it was reported that the former football player had taken a job at the investment firm Neuberger Berman. As already mentioned, Will Proctor married the Fox and Friends co-host Ainsley Earhardt in October 2012. The marriage produced a daughter named Hayden in 2014. The young family was living happily – at least, before the public glare, until news broke in October 2018, exactly six years after the start of the marriage, that things had gone sour between the couple. Earhardt announced that she and her husband of six years were separated over the allegation that he supposedly had an affair. Although Proctor would later deny the allegation, he was the one that took matters into his own hands as he filed for divorce at Manhattan Supreme Court in New York, a day after his soon-to-be ex-wife made the announcement. While Proctor said he never expected the break-up and confessed that he was devastated by it, his wife said they separated ‘after much prayer and careful consideration’. So far, available information shows that Will Proctor and Ainsley Earhart have not finally divorced. The legal status of their relationship is ‘separated’. But, in an interview quoted on New York PageSix, Proctor says he remains committed to carrying out his fatherly responsibility and “maintaining a friendship with my wife even though she has decided to move on”. Having played professional football in the past, it is no surprise to find out that Will Proctor has an imposing frame with bulging pectorals and biceps. His listed height is 6 feet 3 inch or 1.91m while his weight is listed as 95kg or 210lb. His eye color is green while his hair color is blond. Also read: Who Exactly is Kelly Nash, How Old is She, How Much Does She Make? In 2017, sources reported that Will Proctor has a growing net worth of $2 million. Although his professional career was relatively short-lived, he must have gathered a sizable chunk of this net worth from his days playing at the Canada Football League (CFL). Also, we must not forget that he worked at an investment firm, where he further got paid a significant salary. According to Glassdoor, the average base pay for an analyst with Neuberger Berman is $71,000 while the average additional pay is said to be $9,404.